The striker was forced off 20 minutes from the end in PSG’s 1-1 draw against Bordeaux. It’s next stop the Euros. PARIS SAINT-GERMAIN coach Laurent Blanc has stressed he will not take any risks with Zlatan Ibrahimovic in the remainder of the season with an eye on Euro 2016. The Sweden international sustained a calf problem in PSG’s 1-1 Ligue 1 draw against Bordeaux on Wednesday and was forced to leave the pitch with 20 minutes left, having earlier scored his 36th league goal of the season. Blanc revealed that Ibrahimovic is being plagued by a minor calf injury and is optimistic he can still play a role in the upcoming Coupe de France final, but added that he has no intention of risking the striker if he is not fully recovered. “Ibrahimovic has a minor problem with his calf, but it was enough for him to prefer to be taken off,” Blanc told reporters. “Fatigue is slowly starting to play a role, but he will do everything to play in our last league game against Nantes and in the Coupe de France final against Marseille. 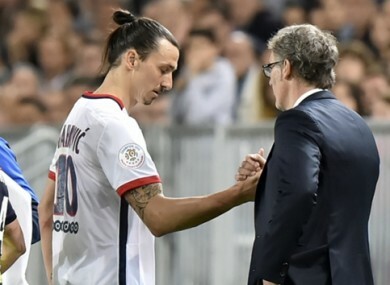 Email “PSG will not risk Ibrahimovic ahead of Ireland game, says Blanc”. Feedback on “PSG will not risk Ibrahimovic ahead of Ireland game, says Blanc”.